Despite supporting various kinds of online play in consoles for literally decades - and indeed, once being a pioneer of this functionality - Nintendo is still a company deeply ill-at-ease with this side of the business. That it has taken over a year since the launch of the Switch for confirmation of the details of its online offering is a clear sign of just how challenging Nintendo finds online services. It's hard to escape the sense that there are two very different approaches to online within Nintendo: a progressive group that embraces network functionality, exemplified by games like Splatoon and unusual experiments like Miiverse and Miitomo, and a more traditional group that's deeply concerned about the dangers of the company delving too deep into a space where it's far from expert, and where controlling players' experiences is difficult. "The Switch online service has a sense of being the bare minimum about it"
This week's announcement suggests that caution and traditionalism retain the upper hand. This is a service that has a sense of being the bare minimum about it - both online play and cloud saving should be a given at this point, and the continued offloading of social functions like voice chat onto a smartphone app is just peculiar and smacks of an insistence of keeping such things at arm's length from the company's offerings. That Nintendo is pricing the service pretty sensibly is its saving grace, but even priced well below Microsoft and Sony's online offerings, it seems pretty unlikely that this barebones package will pick up many subscriptions beyond the Splatoon 2 and Super Smash Brothers online die-hards. Except, of course, that this service also seems to be where the morphed (and significantly diminished, thus far) version of the Virtual Console offering has ended up - which could be a pretty major selling point. The broad concept of adding Nintendo's superb back-catalogue titles to its online subscription service is one that makes perfect sense, especially in the context of Switch not being a particularly big console for online gaming (and thus a slightly tough sell for an online gaming subscription service). Sony faced a similar challenge with the launch of PS+, and made 'free' games into its hook - something which turned out to be a powerful differentiator for PlayStation, and which has of course now been replicated in an even more aggressive form by Xbox. For Nintendo, the Virtual Console catalogue is an ideal place to look for that kind of value-add - especially since many Virtual Console titles have been thoroughly milked dry in other commercial contexts over the past few years, from re-releases on various systems, through Virtual Console itself, and most recently with the NES and SNES Classic micro-consoles. There's likely a degree of consumer exhaustion settling in around re-buying these titles, but having access to them on tap as part of a cheap subscription still seems pretty appealing. "It seems unlikely that the full Virtual Console catalogue will ever be included in the subscription"
Yet here too there's a sense of the reticence that always tinges Nintendo's forays into online services. Virtual Console was turning into a very well fleshed out and populated service on the Wii U, and the NES games being offered to subscribers in the initial Switch catalogue are a pretty poor substitute for that. Of course, Nintendo doesn't actually describe this as a replacement for the Virtual Console, per se, but it will inevitably invite those comparisons, and they are not in the least bit flattering. It seems unlikely that the full VC catalogue will ever be included in the subscription - too many deals to strike with too many publishers - but at least getting a small number of games from various platforms, instead of a batch of NES classics, would have been a convincing statement of intent for the launch of the service. A statement of intent would have been useful, too, in heading off further unflattering comparisons; it may not be entirely fair to compare the games you get through a Switch online subscription with those you receive as part of a PlayStation or Xbox subscription fee, but you can be damned sure that plenty of consumers are going to make that comparison nonetheless. Part of the problem, I suspect, is that Nintendo finds itself conflicted over how best to handle its valuable back catalogue of IP and software. It knows there's value there, and has successfully exploited it for years, but it now finds itself at a crossroads. Using these ageing games as a value-add to boost subscription revenue makes sense from many perspectives, but the runaway success of the NES Classic threw a curveball into that thinking. Nintendo didn't expect that level of success, obviously, and now it's left wondering if bundling up all of its back catalogue titles into a package to support an online service is really the most effective use of that asset, or whether it would effectively be shutting off its capacity to create more cheap, enormously profitable hardware like the NES and SNES Classic. "Using these ageing games as a value-add to boost subscription revenue makes sense from many perspectives"
The problem is that it's not clear what kind of sustainable market, if any, you can build around those sorts of products. A subscription service giving players access to Nintendo's historical catalogue would be an amazing selling point for Switch and a great, stable revenue stream for the company. But it has grown accustomed to charging high prices for its back catalogue games, and it is likely struggling with the notion of handing access over for such a low monthly cost. This is, of course, not a new dilemma; it's essentially the Netflix dilemma that so many movie and TV companies have had to wrestle with for years. I'd argue, however, that being tight-fisted over old titles is not a great look for Nintendo, and even if it's serious about getting a bit more of the VC library ported over to the new service, its reluctance to commit more fully to this model will play poorly with consumers at a time when Sony and (even more so) Microsoft are embracing the notion of subscription access to game libraries of much more recent, costly titles. It's worth clarifying, though, that none of this is of existential importance to Switch. The console isn't primarily an online gaming platform, and while a failure to get better at that kind of service might be leaving revenue on the table, it won't harm the system's current market appeal either. It's less clear how many consumers might have bought into Switch with a background expectation of being able to eventually play back catalogue games on the system - probably not very many, but equally, the success of the Classic consoles does show just how enthusiastic people remain for these games, and if anything demonstrates how strong a selling point an extensive historical catalogue could be. For the broader industry, however, the historical prominence of Nintendo gives the whole question of how it chooses to handle its back catalogue an added degree of importance. Virtual Console wasn't just stocked with Nintendo titles, after all; it was platform in its own right, and pointed towards one possible model for how the industry might be able to exploit the value of its historical assets. A subscription type service is another such possibility, and if Nintendo - as one of the few companies with the clout to find a solution - could figure out revenue sharing, many companies would likely be interested in adding their older titles to the offering. The problem is that Nintendo needs to pick a model and commit to it, and its historical reticence over online services has thus far made that impossible. 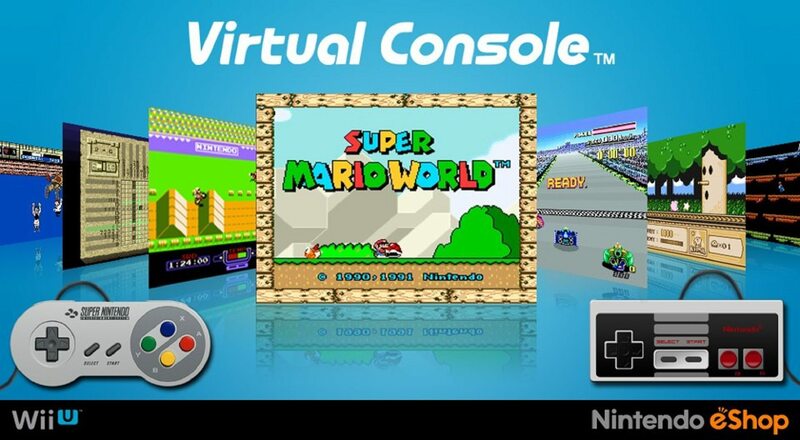 Virtual Console ought to have outlasted the Wii U (it's rather implied in the name itself, after all), but it didn't. If Nintendo is serious about the idea of having a kind of "Netflix for retro games" in its Switch subscription service (and it's entirely possible that it's not serious about that at all), it will need to demonstrate a bit more commitment to the concept before any other publisher judges it worthwhile to be involved. I think you're creating problems where they don't exist. And, to me, the inclusion of the NES games and cloud saves (and whatever else will be there day one) as more of a value add so customers forget they are being charged for what was free before. Don't think buying the same old games again for the 4th time in the past 10 years is a big selling pt. I do think there's a lot of over-analyzing a lot of this. Nintendo has long since embraced games-as-a-service. It launched two such titles last year in Splatoon 2 and Arms, not to mention the updates it's continued to make to Zelda and Odyssey. Couple that with Smash Bros this year, and whatever else it has in store. Nintendo is building games where it looks after its users for months and years after release. The problem is that outside of the occasional premium DLC, and increased software unit sales as a result of this long-tail support, Nintendo isn't monetising these customers at all. They're keeping Splatoon players in Splatoon, but why? Does that not potentially harm sales of future Nintendo games? It's a good way of keeping engagement up on the platform, but what's the use of that if gamers aren't going to support it financially? Nintendo's reticence around microtransactions is understandable considering its audience, so how do you make this model make sense? The answer is to charge for the online service overall. It makes sense. It's inevitable Nintendo will keep making these GaaS games, whether that's through existing IP like Animal Crossing or Mario Tennis, or new IP akin to Arms. And those customers will happily pay $20 if they want to stay engaged with those games online. The Virtual Console conversation is almost separate. Rob hit the nail on the head in the reason why Nintendo is slow releasing more back catalogue games on the platform. They may well have been planning a back catalogue streaming service, whether it's called Virtual Console or not. But when you sell 5m SNES Minis (1 million since the start of this year), why put that business at risk? I suspect SNES games will be there soon enough. Probably after the inevitable N64 Mini. And then so on. There's no rush around this service. Those Nintendo games aren't going anywhere else. Switch doesn't need it just yet.